During April and May Aarush and Pamela went to Swimming pool almost daily for a few weeks. Every day around 10:30 or so he would make his best effort to get his swimming gear and would ask us to put it for him. But after few weeks we had to stop as we realized his cough was not getting cured and he got lots of sun tan. And now after the operation he is out of scope for any water sports for next one year. Really do not recollect how I came first time to Team-BHP web site, specifically their forum. And from then on is kind of hooked though not a car freak myself with limited understanding for these electro-mechanical wonders. What fascinates me is travelogue section of this forum. It is great to find so many passionate souls sharing their trips and tricks. Last November got an unexpected mail about a meet-up @ Yelagiri for Bangalore team-bhpean; was not sure to join or not. Too much of work at the office made it very difficult to commit. On that special day somehow we started early @ 6:30 from home. Little -A was sleeping when we started and there was thick fog when we reached Dakshin Honda on Hosur Road. We saw many cars with BHP bumper sticker waiting on the side of the road. Soon we crossed Karnataka border and reached the town of Hosur. The road condition changed. Suddenly all pot-holes were gone and driving becomes really cool. Definitely, politicians and bureaucrats of Karnataka need to learn something from their neighbor. We stopped at A2B for breakfast, around 70 KM from Silk Board Junction with Petrol Pump next to it which you can't miss it. There was lots of crowds; it took us a while to get a decent place to sit and much longer to get our idli-sambar. We left for Yelagiri Hills and soon left NH7 for NH46 after first toll booth. There are signs for Chennai which you need to follow; continuing on NH7 will take you to Salem. So after driving another 50 KM, we crossed another toll booth from where we left NH46 for Yelagiri. This state road was not that great but OK. The last 14 KM is on the hilly section with hairpin turns. As we were quite early; not much traffic before or behind us. Plenty of monkeys along the road, they target cars for easy food if you are not careful. We reached Yelagiri lake around 10-ish. Took a full round of the lake. With Aarush we had no plan for hiking and boating so decided for lunch. It was around 11:30 when we reached the Hotel Hills. The hotel was not ready for lunch yet and Aarush had his lunch at reception while watching some Tamil songs at the big screen. He was too sleepy to finish his lunch; we decided it might be a better idea to start for Bangalore while he sleeps skipping our lunch. Good breakfast, a gentle walk, lots of rest followed by lunch more rest another stroll in the evening then Dinner -- lots more rest, A blissful weekend. On the way back we stopped again at A2B for a very late lunch. After crossing Hosur, entry to Bangalore was painful. There is a huge construction site around Electronic city for the mega fly-over on NH-7. We visited one of my college mate in Hmatesayout on the way back as we reached Bangalore well before Sunset. After rice ceremony at Siliguri we finally came to Bangalore. This time he was fine both in train and plane. We stayed in service apartment for 3 nights till our things moved to our rented apartment. Too many changes of weather, locations and little less care Aarush got high fever for the first time and we had to rush him to Manipal. When it settled we started to strolled within our apartment complex to know our neighborhood more. Soon realized it was difficult for me to take him out carrying him in my arms. We bought stroller one weekend and he started to enjoy a lot while going out. I used to even make him sit at times at home on the stroller when I have to do household chores and stuff. Definately those time he didn't liked much sitting strapped at one place. While on other hand I knew he was safe, secure and watching me. After a long time we were of our own I mean it was only three of us now. 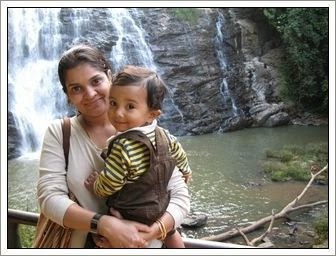 Everything I do for and with Aarush gives me an excitement and satisfaction on successfully accomplishing it. It might sound weird but that is true. Like yippee... I did it. We had our first baby bath together, without anyone around. It was my first time ever to give our baby a bath alone. Usually, me and my maid use to do it together. I use to prepare the bathroom, get warm water in his tub prepare the make up room, his clothes. Then during bath time, my maid use to be in charge with soaping and pat drying. Now, since we are of our own I didn't want to have maid for Aarush till I am not going for job. So there were many first attempts. On his eating habits once he mastered fruits I introduced him to cerlac and other new foods. As a first taste of solid food – puree of khichdi. At first he didn't liked much but slowly he started liking. Mashed potatoes, carrots, beet, papaya and peas were given along with khichdi to him. This month we tried new recipe- ragi porridge as breakfast which he liked ...not in first attempt ofcourse. Santanu sometimes use to feed him before going to office. It was quite harassing - and very tiring - to cope with the little 'night owl'. He use to sleep right after dinner for hour or so and use to woke up as fresh as a daisy and be awake till 1AM in morning completely draining our energy. We visited doc and he suggested to keep the lights subdued so that the baby's sense of time is not disturbed and asked to follow a regular pattern. I use to massage him twice daily as massaging might relax and it may be good as prelude to sleep through the night. After massaging I use to feed him his dinner and then rock him to sleep with lights off. It worked that way. Certain days Santanu also use to put him to sleep which was a big help. I was asking for a mattress from quite a long so that I can put Aarush there and can do household chores tension free. But it never happened unless on one fine day he fall from bed while rolling. I told my hubby I knew, oh I certainly did knew all about this but...Learnt a hard lesson this month- never ever leave child unattended when once they are mobile. Immediately, got mattress that evening. (....Continued...) Next day we woke up leisurely had a wonderful breakfast . 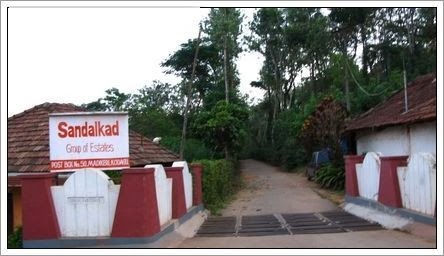 Our host meticulously wrote down all the attractions near Madikeri. The list included Tala-Cauvery – birth place of river Kaveri, Raja seat, Abby Falls, Omkareshwara Temple, Cauvery- Nisargadhama. We decided for all except the last one as we wanted to take it easy and not rushing between attractions. As soon as we started driving to Madikeri (district headquarters of Coorg) the real beauty of Coorg started to unveil itself. The air was clean - fresh but was bit chilled. The lush green hills with teak trees and coffee plantation rejuvenated our eyes and mind. Coorg is in on the western ghat of India and above 1500 m. This makes this place cooler through out the year. Local call Madikeri the Scotland of the east (in North East Shillong is refereed as the Scotland of India). There are numerous coffee plantation sizes various from few acres to hundreds. With coffee there are other plantation like orange, pepper and nutmeg in between. Almost every plantation has one or more streams for water - all these streams joins Cauvery. as they descent. But currently the biggest challenges are labor as traditional labors are migrating to urban areas for a better paying job and lifestyle. Heading towards Tala-Cauveri passed Madikeri, it reassembled like small hill town of North East with houses painted in bright colors perched on hill. This route leads to Mangalore. Being a weekday there were not many cars towards Tala-Cauvery. Tala Cauvery is around 40 KM from Madikeri. On the way we took few stops to shoot pictures with clear blue sky. Only few days back, there was a Marathon(44KM) and road was marked with distances from the finish line. Last part of the road was straight uphill climbs from Bhagamandala. Bhagamandala is supposed to be sangam of three rivers; Cauvery and the Kanika are the real one, while third one is invisible (mythical). There is a temple but we did not stopped and continued to final destination through winding roads. 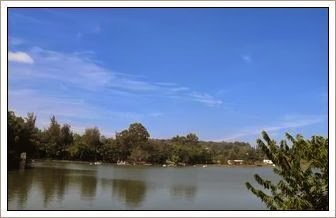 There is a pond which signify the origin of Cauvery. 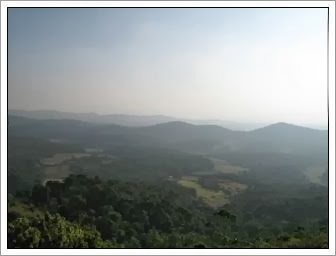 Its situated on slops of Brahmagiri hills. 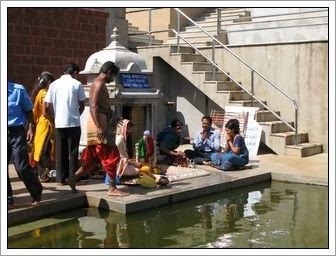 Every year during Makar Sankranti the pond over flows with water and devotees collect them as holy water. There are steps which takes you to the peak and gives a bird eye view of the temple and pond from there. I took Aarush in Kangaroo-sling and he co-operated. It was very windy at the top which forced us to come down quickly. On the way back, we had lunch at East End Hotel on the highway towards Mysore next to petrol station. We ordered some rice and chicken curry(kodava style). The ambiance is ordinary but crowded which means it is a popular destination and safe place for dining. After lunch we headed for Raja seat but somehow missed first time and had to make an U-turn to comeback. Former kings watched the sunsets with their loved one from this place. The curved road to Mangalore under the valley adds magnificantly with hills, green valleys, studded with paddy fields in the background. There is a toy train which was not running at that hour for kids and family. 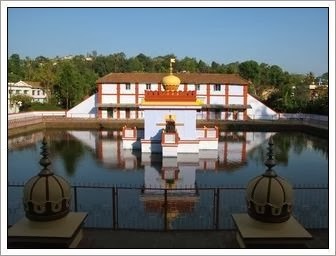 From there we went to Omkareshwara Temple; this is within Madikeri town. It was built by the Lingarajendra II in 1820 in the combination of Catholic, Keralite, Gothic and Islamic styles of Architecture. We could not enter the temple as it was closed during the afternoon. After that we rushed to Abbey Falls this is going back towards Mysore road and taking a left from the highway. In local language Abbey itself means falls so a literal translation will be falls falls. This road is winding and narrow and we need to keep on driving as Sun was dipping quickly. This falls is located within a private property but open to public. Aarush too a quick short nap in this part. Soon roaring water woke him up. It was a delight to find plenty of water during dry months of December. During the monsoon season from July to October it must be flowing like a torrent. The view from the hanging bridge is quite enjoyable. The cascading water descends to the river Cauvery. Headed back to home-stay before it was complete dark. Next day morning we were not sure what to do (as Nagarhole and Dubare will not be enjoyable for Aarush) and ultimately decided to head back to Bangalore. We came back to Mysore spent a good amount around the main market area and Ramkrishna Mission. Around dusk we left Mysore so that we can reach Bangalore bit late avoiding evening's rush traffic. Bottom line is you can visit Coorg all year around if you love rain or aviod monsoon as it rains a lot in the western ghats. Getting out of Bangalore is really difficult but leaving a place like this is very painful after a nice trip. Aarush was having cough for long time almost few months from now. Every now and then it used to increase and then it subsided with cough syrup. Every time we thought after a week of cough syrup treatment it will be better but it somehow never got cured completely. In between, we tried different "pathys" as suggested by experienced parents. Now last month while he was getting immunization after 15th months doctor suggested to visit ENT specialist because of prolonged cough and speech delay. We took appointment with ENT specialist at Manipal hospital and he gave him some antibiotics. After two more visits he felt both his ears still have congestion and things are not improving. The same line thought was shared by his pediatrics too so suggested for a microscopic operation. It seems middle ear infection is quite common for children below 3 years. Read the same on WebMD if you are curious. There is a nice slideshow to explain. Filled all the pre-approval hospitalization forms and again another set for Insurance company. And ensured bed/room booking is all set before the big day. Night before Aarush got admitted and we three spent the night at hospital. Aarush was in very playful mood. Might be Aarush was thinking he has came to a hotel for a travel or so. Few doctors and nurses made visit and advised Aarush should be not given any food or drink after midnight. He was scheduled to be operated in the morning itself. Around 10.30 PM nurse came to take his blood sample of about 3ml which was horrifying experience for all. In the morning, he got his hospital dress and wrist band before moving to OT. He was in very cheerful mood as he couldnot make out what actually will happen next. While we were waiting just outside the OT we saw 2 others little boys being treated on emergency. Pamela recognized KOUSIK - they were there with their son Iravan. We only know them virtually as we follow their blog from time to time. We were not in a mood to say 'hello' for a quick introduction. Wishing a quick recovery to Iravan. Aarush operation finished within 45 mins. He was very cranky and cried a lot after returning from OT. IV fluid channel was setup in his right hand and he wanted to remove the same. After 30 mins or so we moved back to our special room. It is now almost 11 AM and still our litte one is without any food or drink for last 12 hours. After incessant crying he slept and woke up bit fresh around 12 noon. We gave him some Mosumbi juice to start with. Around 1 afternoon he had his lunch and being famished he finished his portion of hospital meal without any fuss. The amount of food supplied was enough for us and we also finished our lunch. Around 2 PM went to see his pediatrics and all seemed normal. But we were still worried about cough and he said it will get better now and to revisit him in a week. Back to room we are still waiting for the ENT specialist to visit so that we can get a release note from hospital. The doctor was too busy and came around 4 PM and we were given green signal for release. Oh ! what a relief... that really is a big burden spending another night in hospital for no good reason. After good nap Aarush was playful, looks like he adjusted with that big needle on his right hand quite well. As we are getting medical insurance to cover this operation we could not be released before completing 24 hours which means we are hostage till 9PM. Dinner for Aarush came around 7PM and this time he did all his routine work for food which means it took an hour with lots of pleading, running behind and cleaning the floor etc. At 9 PM paid my part of the payment and got the release order by 9:30 PM we were out of hospital. P.S. 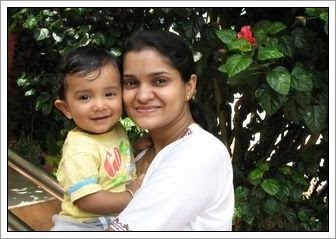 Aarush is doing well(finger crossed). Hope he recovers speedily. (....Continued) Soon after leaving Brindhavan garden and on touching the highway (SH88) road condition improved which looked like recently renovated. Aarush was fast asleep after having his lunch which always translates in smooth driving and I was able to drive at 80-90 KM. Along the road crossed Bilikere, Husur & Piriyapatna before reaching Bylakuppe. 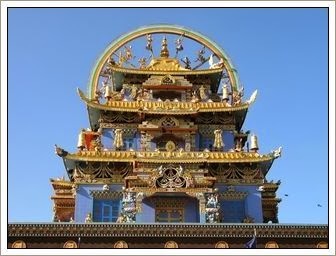 It is an odd name which houses one of the largest Tibetan settlement in India. We had to take a left turn from SH88 to go to the monasteries. As soon as we took left turn we almost felt like driving in North-East where you are greeted with Mongolian faces. There were bright prayer flags along the road which symbolizes hope where as white ones are for death. This is really a bit of surreal - you are at middle of Karnataka, only few hundred kilometers away from Bangalore and surrounded by thousands of Buddhists monks and families. These people have left their home land almost 40 years ago and new generation are born here only. Still they keep their faith and tradition alive for generation to come. Like all Tibetan settlements in India here also one requires special permit for "Non Indian(foreigner)" to visit. We went to Kagyu monastery first. This one sits on a hill top from where you can see “Nalanda Institute” and other monasteries. 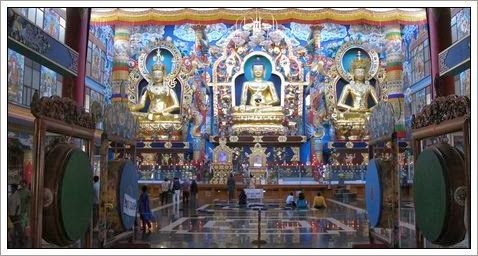 The largest of these 4 monasteries is Namdroling or commonly known as “Golden Temple”. That day sky was in perfect blue and shrine with bright colors were looking magnificent. Unfortunately, we ran out of battery(camera) inside Namdroling. Aarush was bit startled with humming sound and to see monks playing big drums. 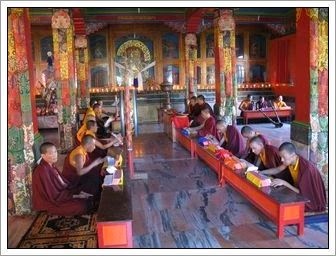 For facts lovers the original name of Namdroling was "Thegchog Namdrol Shedrub Dargyeling" luckily his Holiness Dalai Lama shorten the name during his visit. Around 5000 monks are today studying there. There is a big shopping area with lots of souvenir shops, ATM and restaurant. Lots of magnificent stone show pieces were available which were expensive for my budget. After having a very late lunch - momo (it was not that great we get better momos at Siliguri - my home town) we started for our homestay which was still hours away. Bengalis are considered as food-lovers (khadya-rashik).For them any sumptuous bengali meal is always incomplete without a sweet dish. Just like any french meal which would remain incomplete without a bottle of exquisite french wine. I was not a big fan of sweet earlier but when you live with someone for a long period of time, you quickly start to adapt some of your partner’s habits be it deliberately or inadvertently. Maybe sometimes for the good or worst - so is my case. My sweet S unlike me, does love his sweets quite ardently. With us, desserts do not necessarily need to be complicated or fancy; they simply have to be labeled dessert. Sometimes, only a piece of quality bittersweet chocolate will do especially after main meal be it lunch or dinner. 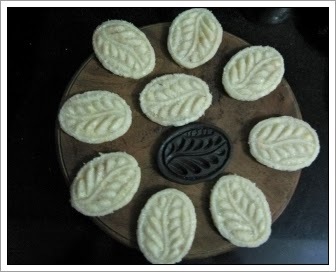 Well known Bengali sweets are generally made of milk products and sugar be it sweetened cottage cheese (chhena), khoa (reduced solidified milk). Sometimes even flours of different cereals and pulses are used to prepare and embellished with nuts, raisins or grated coconut. From quite a long, I was craving for Narkal sondesh (grated coconut sweet). But somehow things were not in my favour and it didn’t get prepared. Much like other aspects of life, it takes a bit of perspiration and lots of inspiration. At last, I had to ask hesitatingly to my Sondesh guru and my inspirer (mil) to prepare for me which she accepted it considering my situation…peut-etre! I learnt preparing this from her but today I will recite my joy of eating for the one she prepared on my request to tantalize my tongue. 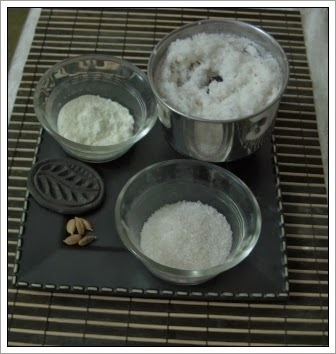 Mix sugar powder and grated coconut paste. When the sugar melts, add milk powder and remove the pan from the heat. Stir few more times. Add the cardamom powder and mix again. 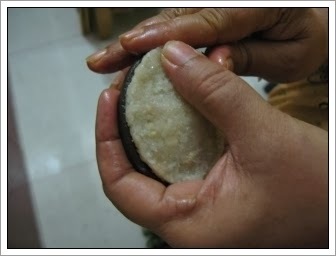 Now cool it a little and then smear the stone mold with oil; Press sugary-coconut on the mold to decorate their upper surface occasionally with help of water. 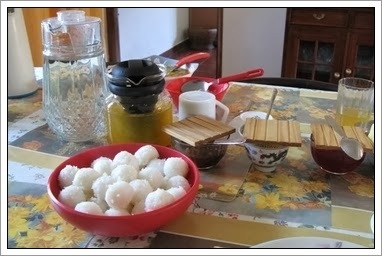 These sweets are commonly prepared for religious festival or marriage or offering to household deity. But as I said, today it was prepared for me. 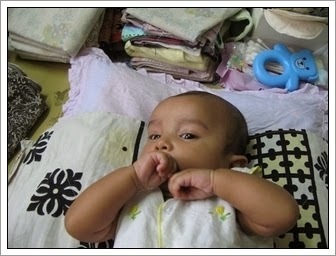 By 5th month slowly started introducing solid food like banana and apple puree to Aarush. According to our custom till "Annaprasanna" we are not suppose to introduce solid food like rice or wheat to baby. 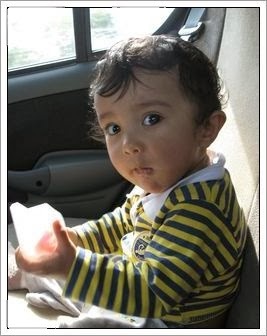 And his didu was also against using common baby food item like "Cerelac" as they contain rice or wheat. This resulted in his first solid bite being fruit -- mashed banana. The first spoon he swallowed as my mom fed him, but little man has a frown of disapproval, like "what the heck they are feeding me?!" Well, as predicted, he didn't like that much for the second spoon and started crying. We had to try again and again. Though we had apples and banana in the fridge for him it seems he started liking banana but not apple puree. His didu use to feed him making him sit on her lap. Our li'l one started to roll a bit; can be on his tummy. He tries to edge forward by pushing with his feet or pulling with his arms. Rarely adorable, toothless smile was given in response to our talk. He can make different sounds come out of his mouth – and was delighted in experimenting with them. By June 1st when his sissy's left my son was bit upset as house was not buzzing any more. He had a great time with them. After they left he use to look around as if he has been deserted. On June 4th his parental uncle came to meet him for a day and Aarush was happy and playful that evening. Suddenly there was strike at Calcutta and uncle's flight was delayed that helped to spend more time with Aarush then expected. This month was very hectic for Santanu as well me. We traveled a lot almost criss-cross the whole country. It was not only traveling but also move from Bombay to Bangalore, Santanu had to do it single handed. From finding apartment to movers, closing or transferring various accounts and establishments was not an easy task. Many a times we ended up in arguments over phone for not things going in a way one wished for. At first Santanu came to Mumbai for 4 days when he spent two days with movers while they packed our belongings for Bangalore. After that he ensured gas connection is transferred which is essential for living in urban India. But lots of bureaucratic paper work as all domestic gas agencies are controlled by government and it is a regulated market space. From Bombay he came to Durg to take us to Siliguri. On June 10th we departed from Durg for Calcutta after our long stay. Aarush cried a lot during this flight but we had a great service from King Fisher hostess. After spending a half day at Central Calcutta (Santanu's uncle's place) we left for Howrah Station in the night. The train was at midnight (23:50 to be precise). Journey by train didn't made him happy. He was OK during the whole day even though it was very hot and humid through out the day. Surprisingly, the ever crowded Howrah Station did not bring any adverse effect on him. But as soon as we got in to the AC compartment he started to cry incessantly. May be because of claustrophobia or some other discomfort can't say....he cried and wailed that were enough to wake the dead. Luckily the compartment was empty and we had no co-passenger complaining. We went to Siliguri for his first rice ceremony which his thamma arranged. It was five days function similar to that of Bengali marriage. On June 16th, he first tasted rice without any fuss. It was a lot of hard work, preparations and although we were dog tired, it was well worth all the effort. All our expected guests came. There he met many relatives as well people from neighborhood. Things went smoothly once we reached there. 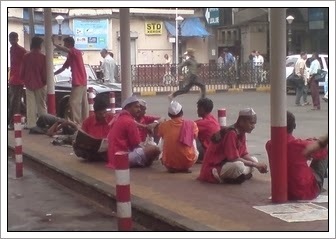 These people in red shirts are commonly known as “coolie” or porters who are commonly seen at Indian Railway Station. They remind me of those childhood days when they were part of our vacation (mass aviation is still in infancy at India). They help to carry big over sized luggage that Indian travelers travel with. As Indian travelers are not that physically fit like westerners to lift their own luggage. Coolies are not permanent employee of railways but have a long and strong working relation with them. They get lots of benefits from railways like medical, schooling for their kids and etc. Their recruitment process is very complex and I am not an expert to write on details. What I know is their badges can be transferred between family members and the definition of family members is very vague. This often results in badge being auctioned between 5,00,000 to 20,00,000 INR( 10K-40K USD). Their working wage according to railway rule book is very minimal; through which they will not be able to sustain themselves or their family. So there is little bit of negotiations between coolie and travelers. Most of the time they are like moving timetable of Indian railways, you can cross check for platform number, coach position for your train and they will guide you to the right place at right time. Going down the memory lane there is a famous Mohmohan Desai's movie by same name acted by none other but Amitabh Bachan in Hindi at 80s. The movie is very close to Bachan fans as he had a near death situation while performing a stunt for this. Whole India was gripped by this news and the movie release was eagerly anticipated by his fans. Gallery 3 is going to a big change from current gallery 2 and initial alpha release did not have any migration path from gallery2. It was pushed to Beta release after 2 alpha releases. but to my surprise I found it was implemented in alpha 4 and here is the test result of a new neat code. I am really liking the new compact code making gallery 3 faster and lean compared to its predecessor. Similar, to WordPress new theme development is easy no more smarty - thank God I never really mastered those PERL look alike. Now it is simple PHP and CSS. Another core feature is Akismet which does a fantastic job of filtering spam comments. I was able to import 3000+ images in 200+ albums without any problem. There are few things which needs to be ironed before I can put the same in production. Aarush and Pamela playing with soap bubbles ; this video is bit old when he did not started walking at that point of time. He was bit amused with bubbles trying to catch them but could not. Normally A is taken to doctor for monthly check-up once other then that no outing for him. As he is considered too small for all these by my parents. So they neither allow him nor me to go anywhere. 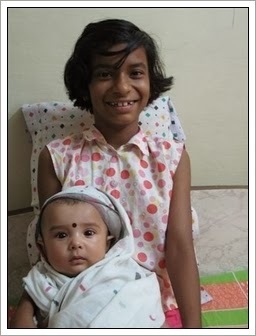 After birth it was third time when Aarush was taken out of the house to meet people other then his doc's clinic. Moreover because of weather it was difficult for us to go anywhere. Worst thing about his nanu's place was sultry sun(temperature reaching 49 º C) because of which most of the time he use to be in front of air cooler. On other hand, its truly becoming irresistible for his dad I suppose. As he came again to meet his son at April end - his heart was at Durg and mind at Mumbai. By now our lil one was able to keep himself engaged by holding a rattle in his hand for quite some time. His maternal aunt along with two sissys came to meet him. They were with us for a month. This month was full of entertainment for him with so many people to take care. His sissys were too excited to have him as their brother. They use to play a lot with him even tell him stories while he use to listen very carefully without any noise – as if he understands everything. Quite often he use to cry in irregular pattern. At first, it made us difficult to understand what actual problem is. Was it out of hunger or feeling hot or some uneasiness. Every few hrs he will cry as he is hungry. Me and my parents were worried that he may be suffering from colic, but then again, he slept well when it was time for him to sleep and played and laughed happily in excitement when he was being teased. However, when it was time for milk, he just refused to take in much, often taking only few ounces. Certain nights were really miserable as I had to feed him after every 2hrs. Since I was with my parents it was of great help at these times. They use to take care of him while I use to catch some sleep at day hours. It seems this problem is common among babies at this stage, and whenever they get hungry, they would drink. With Aarush, the slightest noise or movement distraction would make him turn away in curiosity, no matter how much I try putting back in his mouth. Now he drinks his milk whenever he is hungry, not on any schedule. 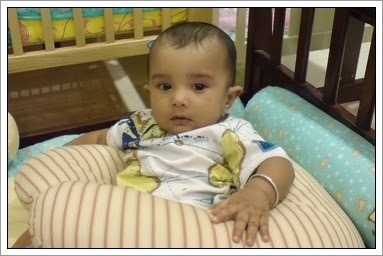 Now, Aarush started to twitch, smile, frown and stretch a lot after waking from sleep. Amazingly ( I never knew this) and apparently babies between three to four months are at the stage where they get very playful and drinking milk is not a priority anymore, I believe. They prefer to talk and coo to adults, and being very observant at this stage and they are attracted to moving objects, colours and everything new around them. So was our little one. 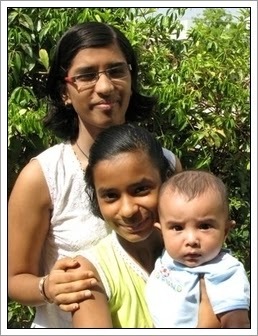 It was not even month stay at Durg, on april 8th Santanu came to meet Aarush for 3-4 days. Before leaving from Mumbai Santanu warned me not to pamper him much by taking him in arms all time but later I found... on hearing one shrill cry he use to run to him. Aarush now started cooing in response to gentle, soothing words of his didu. Keeps his fist in his mouth most of the time and drools sometimes. Enjoy holding his toys for a short period of time. Turns head towards sounds. Rattles, bright pictures use to attract him. His Mesho (maternal uncle) came to meet him unexpectedly. Now he started liking to be held upright. By now he can lift up his head and hold it up quite steadily for quite a while. He smiles when we tickle or touch his cheeks, and his cooing just melts our hearts away! He captures the hearts of every people who come to meet him. Now lots of visitors come to meet him. Sometimes he use to blow bubbles a lot. Nanu and didu were very happy with his stay at their place. Every morning nanu use to spend quality time with him. Every hour or so his nanu use to come to see and talk to him. My dad is not at all trained with baby care but then also use to carry him with nervous hands and Aarush never use to do any mischief with him. Thrice he put his grandson to sleep when I and my mom were busy in work. So, were the days at our end.